I’m spring cleaning. My face is grubby with dust, my knees are black with grime and my nails… Well, let’s not go into too much detail there. This is a food blog after all. Don’t want to put you off the post in the first few lines. All you need to know is that I’m a busy bee today and don’t have much time for preparing food. Kathryn at Limes and Lycopene is also busy this week and, as a result, is blogging about eating well when short on time. She asked her readers what they ate when in a rush. My first reponse was baked beans, eaten cold, from the tin. But that’s only when I’m really really rushed. Or really really hungry. On normally busy days I usually just look in the fridge, cupboards and freezer (in that order) and see what I can whip up with as little hassle as possible. Today was a day like that and what I whipped up was really rather good. The idea comes from Helen at Food Stories. 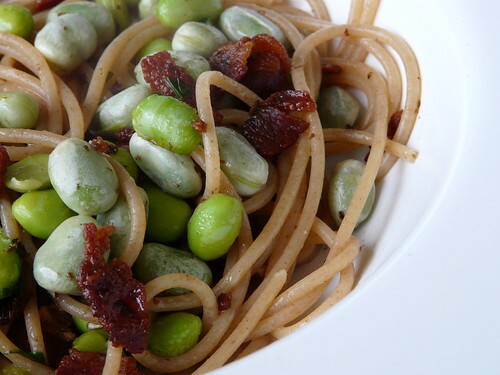 A few weeks ago she blogged about an Edamame and Broadbean Salad with Panchetta. It looked so very pretty and sounded so very delicious I knew I’d be making it soon. And I will. Today, however, I borrowed the basics of the dish and turned it in to a rather more substantial pasta lunch. Thanks for the inspiration, Helen. It was superb! Bring a pan of salted water to the boil. Add the edamame and broadbean and boil for 4 minutes. Scoop out of the water with a slotted spoon. Peel the broadbeans if you feel the need – I like the skins. Add the pasta to the boiling bean water. Cook until al dente. Meanwhile, add the bacon to a non stick frying pan, without oil, and cook over a medium heat until crispy. Reserving a little of the cooking water first, drain the pasta. Add the beans, basil and pasta to the frying pan with the bacon. Toss. Add a little of the cooking water to loosen. Season carefully, drizzle with a little extra virgin olive oil and serve. Yum. Bacon. This looks like a great quick meal–thanks for sharing it. Happy cleaning! Johanna – My brother used to come home from the pub, make a mountain of cheese on toast then fall asleep. In the mornings when I used to wake him up the cold, greasy pile of food was still there. Haven’t been keen on cheese on toast since! I go for sweetcorn if I am starving! I like my beans hot! Hey Wendy, I’m so glad I inspired you! That variation looks so delicious. I’ve never thought to add the combination to pasta but I’m going to try it next time I get my hands on some. Reciprocal inspiration! Hi Wendy, I’ve never thought to put edamame beans in with pasta. But it’s a great way to get some protein in there. Sophie – I adore them. They used to be served salted and in their pods in bars in Japan when you ordered a beer. Much better than peanuts! Helen – I’m having it again tonight, it was so good! Kathryn – I hadn’t thought of it either. It worked very well though.